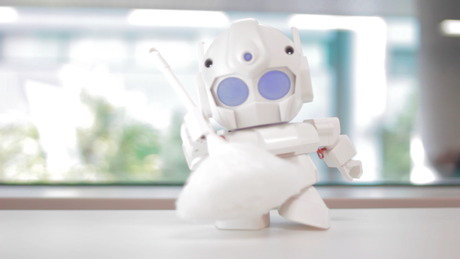 It was only a matter of time until someone used the Pi to make a programmable robot, and this cute but highly functional design from Japanese entrepreneur Ishiwatari looks the best so far. Creating a 3D-printed chassis, he's slotted the Pi into the head section, used servos (devices that correct the performance of a mechanism) to control the hands and feet, and a motion sensor to allow the Rapiro to carry out tasks such as guarding your home and even doing a little light house work with its mini-duster. But don't fire your cleaner just yet: at only 10 inches it can't reach very high.